Portlanders love their unique airport. They also value labor unions. One of those two things has to give. 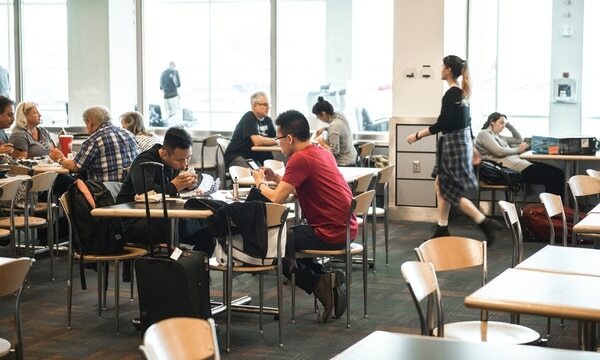 In February, Portland International Airport will unveil the latest additions to its lineup of Portlandian drinking and dining. The airport's owner, the Port of Portland, recently signed 10-year contracts with Deschutes Brewery and Hopworks Urban Brewing to open new pubs in the D concourse. 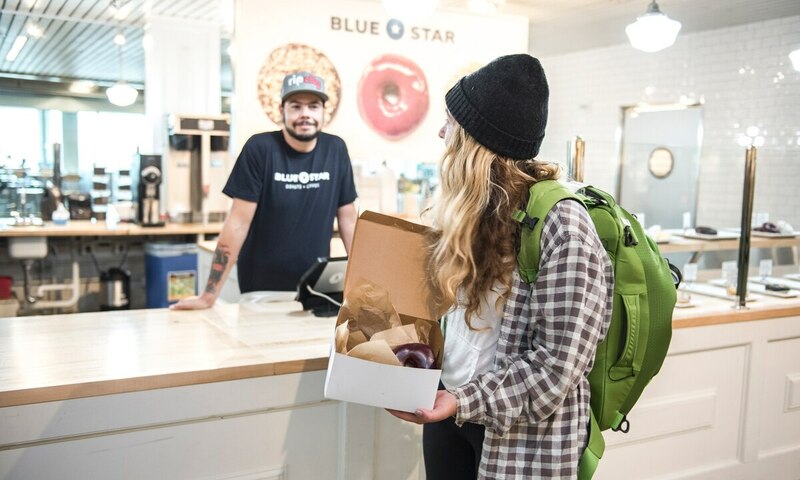 But if one of the nation's largest labor unions gets its way, those openings could mark the last time local businesses claim a foothold inside PDX. Unite Here, a New York-based labor union, represents airport concession workers up and down the West Coast—but for now, only a small percentage of those in Portland. For the past two years, it has been urging port officials to dramatically reduce the number of concession contracts at PDX. That change could sweep out local beer and bagels, but make it easier for hundreds of workers to join their union. "Workers at PDX are falling behind," says Stefan Moritz, an organizer for Unite Here. "Housing and other costs are going up far faster than their wages. Portland is the only major West Coast airport that doesn't have a solid labor retention policy. We'd like to change that." Unite Here is a powerful force in the nation's airports. And for the first time in decades, PDX's business model is under pressure from the union, which has shown an ability to dictate terms in West Coast airports from Seattle to Los Angeles. "Unite Here is very big in larger cities," says Felicia Hagins of SEIU Local 49, which represents 600 non-concession airport workers. "They're very serious about what they're doing at PDX and they're in it for the long term." Unite Here workers at PDX get a small premium above Oregon's minimum wage, currently $11.25 an hour in the metro area. Workers at Seattle-Tacoma International Airport make $15 an hour. Portland's minimum wage will not rise to $15 until 2023. At issue are two different visions of PDX: Port officials believe the airport's mission is to serve passengers and promote the region for tourism and economic development. Labor representatives say the publicly owned facility should focus more on the pay and welfare of airport workers. As regular national accolades show, Portland is a recognized leader in concentrating on customer satisfaction. 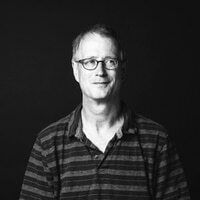 "There has to be balance, of course, but my belief is that airports operate for the benefit of travelers," says Daniel Bubb, a former airline pilot and now an assistant professor of aviation history at the University of Nevada, Las Vegas. "Flying is such a frustrating experience for many people that airports are trying to pick up the slack." For the past five years, Travel & Leisure magazine has named PDX the nation's top airport. Port staff attribute that ranking to two factors. 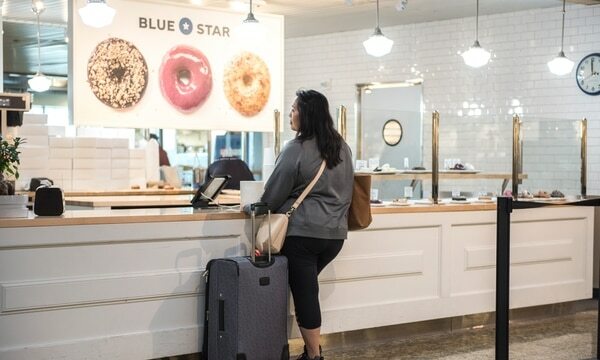 First, they credit the lineup of local restaurants, bars and shops at PDX. 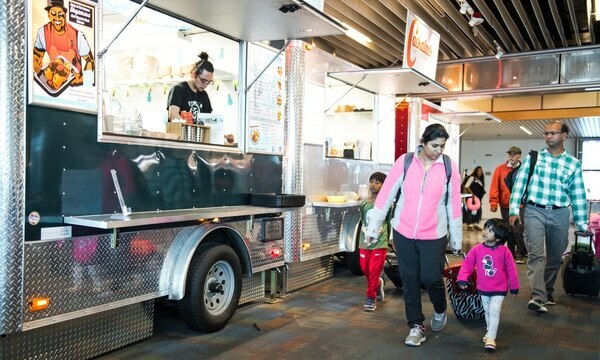 Officials also point to so-called "street pricing," a policy that requires vendors—including national chains such as Starbucks and McDonald's—to charge the same prices in the airport as they do elsewhere in the city. "We think both of those factors make us unique in the industry," says Chris Czarnecki, who directs concessions at PDX. "Most places you land, you could be in Anyplace U.S.A."
Related: Portland International Airport even sends out spies to make sure businesses aren't price gouging. Port officials point to one metric—dollars spent per passenger—as evidence that their formula works. 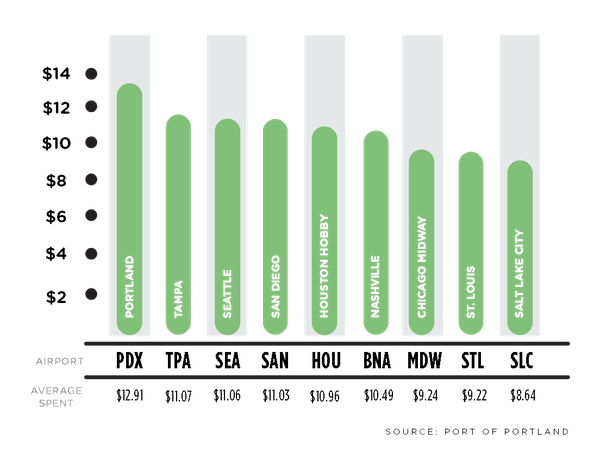 The 60,000 passengers who flow through PDX each day spend more money per person than passengers at airports in wealthier cities, including Seattle, Boston and Washington, D.C. And compared to peer airports, PDX comes out on top (see chart below). "It's our belief that street pricing helps generate more revenue than if prices were higher," Czarnecki says. "Somebody who pays $5 for a bottle of water isn't going shopping." In 2016, Portland International generated more concession dollars per passenger than peer airports. Unite Here is building momentum at PDX. The union organized about 100 restaurant workers in 2015 and 50 retail workers last year—although that still leaves about 85 percent of the concession workforce unrepresented. The union wants port officials to change the way PDX does business. 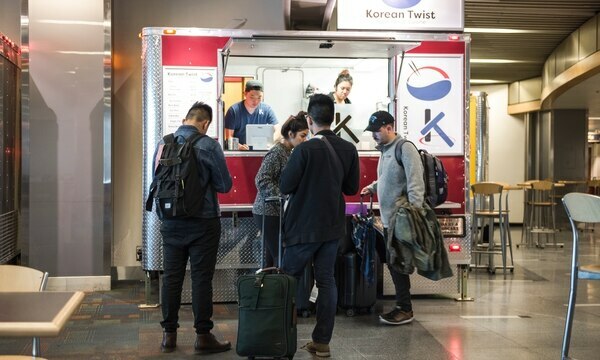 Right now, 40 different concessionaires operate at PDX, including local favorites such as Kenny & Zuke's, Bambuza, Country Cat and the boutique Tender Loving Empire. Kristen Leonard, the port's in-house lobbyist, says that would change travelers' experiences. "You'd have a lineup of Burger Kings, McDonald's and Taco Bells," Leonard says. Unite Here's second wish is for the port to abandon street pricing. The union argues that high airport operating expenses combined with price constraints squeeze workers. "The only place you can save is on labor costs," Moritz says. "This creates a real tension." Unite Here representatives have paid regular visits to port commission meetings recently. They're finding some support on the nine-member commission. In August, when the commission voted on the Deschutes and Hopworks brewpub contracts, two of the nine commissioners sided with Unite Here. "When you have street pricing, it is coming on the back of the worker," said commissioner Tom Chamberlain, president of the Oregon AFL-CIO, before voting against the contracts. Chamberlain declined to comment for this story. Ultimately, the public policy question is whose welfare the port prioritizes: travelers or the workers who serve them. Bubb, the UNLV professor, says research shows travelers are very attuned to their airport experiences. "People will pay more money to avoid a lousy airport," Bubb says. "Airports are the first and last points of contact for a traveler. If an airport is unpleasant, travelers will go out of their way to avoid it."